TAG Oil founder and Chairman Alex Guidi takes a step into the spotlight, to talk to the folks at OTC Markets. As this month's feature interview, we got the chance to spread the news TAG's oil and gas drilling success, record revenues, exploration strategy, and sound financial fundamentals, as well as New Zealand's major untapped potential. Says Chairman Guidi, "Exploration is a risky business. However TAG Oil is an opportunity for investors to participate in a high-impact exploration company with risk mitigated by a foundation of reserves and an established production base. We have years of development drilling opportunities ahead, state-of-the-art infrastructure in place to handle growth, and a portfolio of drilling opportunities with significant undiscovered resource potential.... When you consider the significant undiscovered potential, a ready market for domestic consumption of natural gas, and the premium quality, high-netback oil sold into the Australasian market, TAG’s potential in New Zealand is very compelling." TAG Oil is a member of the OTCQX, designed for investor-focused companies that meet high financial standards, are current in their disclosure and receive third party advisory. According to OTC, "The companies found on OTCQX are distinguished by the excellence of their operations and diligence with which they convey their qualifications." Noted Canadian investment bank, M Partners, just released its Top Five Picks for 2014, and TAG Oil made the cut. The report highlights the up and comers on the firm’s investment radar for the year ahead, and each of the five companies profiled is expected "to lead their respective universe of coverage over the course of the year." So, what do they like about TAG Oil? 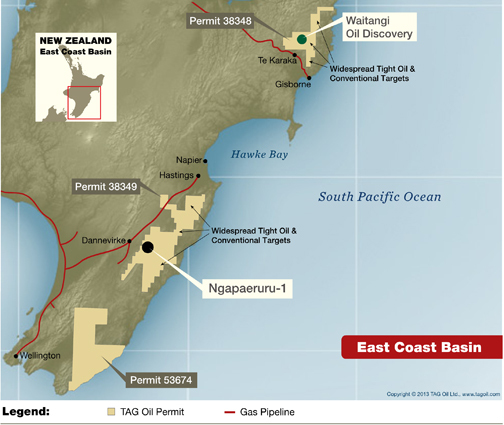 They appreciate TAG's strategy of establishing its cash-flowing production base in Taranaki to fund the search for higher impact, deep gas plays with considerable upside potential. And that the production income from our shallow, producing Taranaki fields has led to a solid balance sheet which also "de-risks" the enormous unconventional resource potential in TAG's East Coast Basin permits, plans for which are advancing in 2014. They report that TAG shares currently trade at 2.2x EV/EBITDA (calendar 2014), which is a significant discount to its Southeast Asian/Australasian comps at 2.9x. In their words, "Underlying our Buy rating is the attractive valuation and significant production growth trajectory, driven by the high-impact deep gas Taranaki program now underway and funded by the solid balance sheet and cash flow from its shallow Taranaki production base." We’re happy to report the positive findings in a report by Horizons Regional Council, which tracks and manages the land, air, and water for a large portion of New Zealand’s north island. Horizons visited TAG’s Ngapaeruru-1 site 11 times to monitor compliance during construction and drilling activities, and to take ground and surface water samples with each visit to test the different phases of well activity. 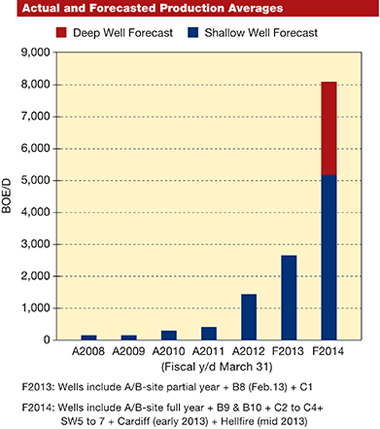 Visits and water analysis showed no incidents – essentially giving TAG and the well site a clean bill of health. TAG’s operating goal is to achieve 100% compliance during all activities of its drilling programs, whether it affects worker or environmental safety, and we thank our team for their care and commitment. We continue to analyze the very encouraging drilling data, and our team expects to make a decision on future activities in the coming months. A slew of analysts' reports were released last week, uniformly positive in their outlook for TAG Oil's exploration, production and performance prospects. For more information, please visit the Analyst page of our website. Alexander Klein of Dundee Securities Ltd. is now among the analysts covering TAG Oil. Please see all the analysts with investment coverage on TAG Oil here. TAG Oil was in some pretty nice company in a recent Frank Byrt piece in The Street. For the whole article link here, http://ow.ly/9FcGr, and for an excerpt, read on. "…In order to find the best of the last group, I screened Morningstar data for companies with solid financial fundamentals, a market value of at least $250 million and a three-year average annual return of 200% or better. TAG Oil, with a market value of $547 million, is a Canadian company producing and exploring for oil and natural gas in oil shale in New Zealand…. Its shares are up 43% this year and have a three-year, average annual return of 318%. No U.S. analyst coverage is available, but hedge fund manager Elliott Associates, with $15 billion in assets, is the biggest stakeholder at 12%, followed by Fidelity and Fidelity Canada, with a combined 7%. Tag Oil said today that it upped its capital expenditures by $66 million to expand oil and gas drilling at its company-owned fields in New Zealand, because its efforts have been so successful. Dollar Thrifty, with a market value of $2 billion, owns, operates and franchises car rental operations throughout the U.S., Canada and abroad. Pharmacyclics, with a market value of $1.8 billion, is a developer of pharmaceuticals used to treat certain cancers and cardiovascular disease. Mitek, with a market value of $302 million, is the developer of software used for image recognition, used in check and document processing, and forgery detection. Jazz Pharmaceuticals, with a market value of $2.8 billion, is a specialty-pharmaceutical company that develops and markets medical products in the fields of neurology and psychiatry. Select Comfort, with a market value of $1.8 billion, makes air beds and other sleep-related products. The company's mattresses have adjustable firmness levels and range in prices up to $2,600. Company profile: Keryx, with a market value of $299 million, acquires and develops products for the treatment of diseases, including diabetes and cancer. Pier 1 Imports, with a market value of $1.9 billion, is a retailer of decorative accessories, furniture, housewares, and seasonal items imported from more than 50 countries. Pier 1 has over 1,000 stores. Lululemon Athletica, with a market value of $8 billion, is a specialty retailer and designer of upscale athletic apparel for women, with a focus on yoga-inspired merchandise. Las Vegas Sands, with a market value of $40 billion, is the world's largest operator of integrated resorts encapsulating casinos, hotels, entertainment, food and beverage, retail, and convention center operations. Content copyright of The Street, Inc. 14 Wall Street, 15th Floor, New York, New York 10005. For the whole article, link here: http://ow.ly/9FcGr. Casey Research, LLC joins the list of analysts with an eye on TAG Oil.